It’s Saturday again, so I’m in the Scotch Malt Whisky Society, and have been for a while. So, a shorter post, as I’m taking time off from drinking to write this. It might be the Scotch Malt Whisky Society, but they also bottle other things. While rums have been more common recently, in the past they’ve also done Armagnac and Bourbon, as well as whiskies from Japan, Wales and Ireland. However, until now they’ve not bottled a Cognac. Rumour has it that the spirit is from Camus. It’s bottled at cask strength, unlike most commercial Cognacs, including Camus’s own XO bottling. While 48.4% may not seem all that strong in whisky terms, it’s a bit of a punch when it comes to Cognac. 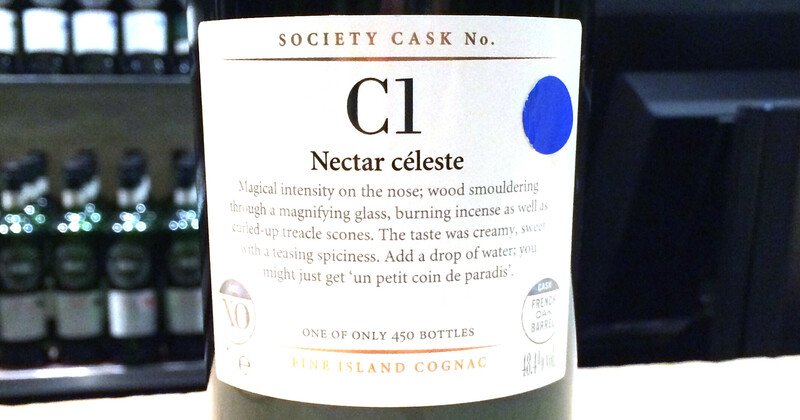 Nose: Unfortunately, I’d had a few drams, and the relatively subtle nose was hard to pick out. Raisin jam, menthol and white pepper lead, with touches of chamois leather. Sitting behind are toasted brown bread notes, panettone and soft spice – cinnamon and nutmeg. Palate: Thick toffee, fragrant caramel and some floral notes start, but it gets darker as it sits on the tongue, with liquorice, lardy cake and treacle toffee. Spice builds on the back end, with smoky and dark notes – black cardamom and garam masala. Finish: Damp leaves and bark, rich earth and liquorice. Anise floats through the middle and lingers, with some damp oak popping up before the death. A whisky drinker’s Cognac, heavier than many Cognacs – its got more weight than most at the back, as well as the traditional floral complexity at the front. My drinking companions this evening all described it as ‘light’, but in the world of boiled wine it’s a bit of a bruiser. If you want to introduce a whisky person the elegant and refined world of brandy, this is a useful stepping stone. Definitely light. Almost bordering on grain I think and I don’t know much about cognac but the wood seemed to sing more than the spirit. I enjoyed it though. Light is right, but that’s Cognac when compared to SMWS-style cask strength whiskies. It’s got more weight than many cognacs I’ve tried, so I can see why they bottled it. Adrian Prooth liked this on Facebook. Do you know if they’re going to bottle any Rye anytime Billy? Not that I’ve heard of. The rock town bourbon was the last American. If Rocktown send them a good rye sample then I suspect they will, but I’ve not heard anything. Bozkurt Bozzy Karasu liked this on Facebook. Beth McCabe liked this on Facebook.